I used to be a huge proponent of preparedness (I still am but I just don’t shout it from the rooftops any longer). Food, water, emergency essentials are all important. So, what kind of preparedness am I talking about? Wills. No matter what age you are, if something were to happen right now, does anyone know not only what your final wishes are but have the legal authority to take care of them? Now is the time to get these important matters dealt with. As I may have mentioned, this year has been one heck of a year. There have been many accomplishments made, some setbacks but mostly it has been a year of discovering what is truly important and a year of reflection. See, my husband was diagnosed with cancer in June (as of right now, he is cancer free). May 1st, my mom (step-mom) was diagnosed with liver cancer (she passed in August). Then, in October, my dad was diagnosed with pancreatic cancer. He just passed November 1. Our family is no stranger to loss. My mom is the last of the children on her side of the family and both of my grandparents on my father’s side passed away, most of them before I turned 30 years old. The one thing that remained consistent with each passing was the breakdown within our families. Siblings who always had issues in the past let it all out. There was no holding back for the sake of the family. I don’t even really remember (in those instances) the offending parties allowing for grieving to take place. Heck, when my husband’s grandmother was still with us (hospice) things were being stolen from the house during visits (we cannot confirm or deny exactly who it was but only someone extremely close would have know where she kept all of her valuable jewelry and that stealing just the stones made it more difficult to report/track). As soon as the patriarch (or matriarch) passed, it was every sibling for themselves. Well, that is now happening with my dad but it isn’t the children stealing from each other, it is another relative! I am so livid that his brand of poison is infecting even more members of my family. And this is why I am writing to you today. Do you have a will? Is it with a neutral party who will not take sides and favor this person over that one? Do you have your valuables stored securely? If you look at someone and say, “They will never steal from me” are you sure about that? A death in the family can bring out the absolute worst in people. Is there anything you would like someone to have that you can give them NOW? If so, do it! If there is someone (like a child or sibling) that you do not want to have anything, be sure to name them in your will and give them 1 dollar (or penny). They cannot contest, saying you forgot about them or some other such nonsense. Does someone have an item of yours that you want back? You better get it back soon or they may claim it for themselves. 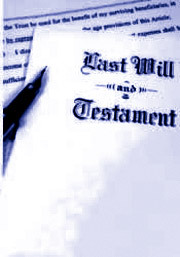 I found this website with free wills and other legal forms that can help you if you have no idea where to start. brendanolen • This entry was posted in Journal and tagged Business, death, family, trust, will. Bookmark the permalink.